No Legal Aid? Milat loses conviction appeal! Ivan Milat today, without any legal representation, which includes Legal Aid, lost an application in the High Court to appeal against his 1996 convictions. The 59-year-old had sought special leave to appeal the murder convictions of seven backpackers and one count of detaining a person for advantage. He is serving a life sentence in Goulburn Jail for the seven backpackers whose bodies were found in the Belanglo State Forrest, in the NSW Southern Highlands, between September 1992 and November 1993. This is a case that deserves Legal Aid, so that a person who is convicted of the worst crime can take his case to the Highest Court in the land. The High Court in Sydney today refused Mr Milat special leave to appeal, saying a NSW Court of Criminal Appeal decision to disallow his appeal was correct. "There is no reason to doubt the correctness of the decision by the NSW Criminal Court of Appeal," Justice William Gummow said. Justice Gummow said no argument put forward by Mr Milat proved any miscarriage of justice had occurred. But there was definitely no argument put forward today by a lawyer or barrister who has the legal knowledge and a full understanding of the law. Mr Milat had argued the trial judge had erred by giving the jury an alternative account of the case which was not put forward by the prosecution. According to Mr Milat, this allowed the jury to find him guilty of detaining for advantage, which was in turn used to convict him of the murder charges. As I have said perhaps not the best argument or a professional argument and who knows what the outcome could have been, if in fact he was provided with legal assistance, considering he has been convicted of the worst crime in Australia. Questions arise, do we want the truth? Is it worth finding out what really happened in the case? Is the real killer still out there? Should people convicted of the worst crimes have the opportunity to take the matter to the highest court considering they will suffer the worst consequences and one of the longest sentences? Not just that but if you read the transcripts of the case the discrepancies that appear are outstanding as well as the venom of the media who made sure he was convicted by the hype not just in Australia but Britain and the world. This month, May 2003, Ivan Milat will have spent six years in segregation/isolation without any charge, inquiry, or breach of prison rules leveled against him. He was placed in this situation and now at the High Risk Management Unit at Goulburn Correctional Centre by Bob Carr and his merry men and by George Savvas, serving 34 years. Savvas an ex-kingpin drug dealer with Labor party close connections who had been employed by state and federal authorities to discredit groups and individuals who were supporting Ivan Milat, in his quest to establish his innocence of the horrendous murders of which he had been convicted. Savvas, with the collusion of state and federal authorities was allowed to "walk" from Goulburn Gaol to gather intelligence and to act as an agent provocateur against Mr Milat supporters. Savvas had not been fed enough information by his minders against his targets. He was sent to the home of a Milat supporter, (big mistake). The "target" quickly smelt a deceased rodent. It looks like Premier Carr's anti Milat Campaign is working well again, his application to the Judge in chambers to seek an order to be allowed to orally argue his appeal to the High Court was refused. Hello, I hope all is fine with you. Thank you for the letter dated 8th March, received today 12th, very inspiring. Forgive me for that incoherent eight pager I wrote out, what had occurred. I was three-four days into this protest, no eating any food. The messages my body sends to my mind is basically saying there is some serious concern on what I'm doing, one gets a clear impression that death is imminent, particularly being in my sealed up box *my cell* (in ordinary circumstances it's a fine line between normality and abnormality. MILAT WAS FRAMED FOR TOURISM $$$$$ AND THE WINNER IS? NOT IVAN MILAT! The bodies of seven backpackers were discovered at the Belanglo Forest in 1992. The victims were German, British and Australian origin. Australia at the time of the discoveries was well advanced in its bid for the Olympic Games to be held here in year 2000. The murders were headlines overseas. The State government's public relations machine swung into action. An unprecedented $500,000 reward was offered for the heads of the perpetrators. (Commonsense says there was more than one assailant). Head of the International Olympic Committee, Juan Samaranch, was questioning whether Australia was a safe place to visit. THE JUDGE: This man should never have addressed the court with out a lawyer especially being kept in the conditions at the High Risk Management Unit at Goulburn in solitary confinement described as a "box within a box" with "no fresh air or sunlight". Mr Milat has self-harmed, due to indefinite prison solitary confinement during his stay at the Supermax and has been denied legal material for his case. The questions arise, like did he have a choice? What happened to equality before the law? Do you think a person convicted of the most serious crime should be able to take his case to the Highest Court? If not why not? High Court judge Michael Kirby says Australia's justice system is weakened by the increasing number of people representing themselves in court. Justice Kirby says he agrees with One Nation founder Pauline Hanson's concerns about the high cost of legal advice. Redfern drug dealers: Who is Mr Big? A senior Redfern police officer says a flourishing illegal drug trade is the main cause of problems in Redfern's Aboriginal community, known as The Block. But just like Kings Cross it doesn't get cleaned up and the Mr Big's are living like pigs. Ha ha. That's right someone supplies and someone accumulates large sums of money and someone has targeted Redfern and allows it to flourish there. NSW Police seizing assets to bolster budgets? Seized assets to bolster police budgets is going to place crime solving into the corporate arena. Why should they go after a common criminal who is poor? Instead they'll be searching for assets and then solving crime. After all, police budgets will depend on it. A magistrate in the south-western New South Wales city of Wagga Wagga says police there nearly beat a man to death, fabricated evidence about him, and later lied in court about the incident. Just how credible is this former cop? Small's claim on Four Corners [Walls, a government propaganda machine], tonight, [that], the Government warned about Redfern problems before the riot. Like he's Mr squeaky-clean? Bad news more like it, Small was the say anything, do anything, ex-cop from hell for Bob Carr and his cronies. Remember one "Flick" and they're gone. A 26-year-old man has died in Brisbane after a scuffle with police in the inner-city suburb of Highgate Hill. Police say they went to a unit complex just after midnight to speak to the man. Inspector Ian Robinson says police used capsicum spray and the man collapsed and died. NSW Police has revived controversial plans for a specialist discriminative squad to tackle the wave of violent crime that has plagued Sydney's south-west for more than a decade. A Sydney man who was acquitted of murder has won more than $1 million in damages for wrongful arrest and imprisonment. The New South Wales Supreme Court has agreed with Garry Raymond Nye's said that the charge was maliciously laid. Acting on a tip-off, [? ], police arrested and charged the 51-year-old with the shooting murder of Roy Thurgar at Randwick in Sydney's east in 1991. He spent 16 months in custody before he was acquitted by a jury. 34-year-old police inspector Shane Cribb, who shot a man shouldn't be treated differently than any other person charged with the same offence. The Daily Telegraph this morning is calling for special consideration for the cop. NSW Police said more than 200 officers raided homes in the largest operation ever conducted by Task Force Gain, set up to investigate gun crime in Sydney's south-west. A police task Force randomly targeting gang warfare [and criminals green lighted by police themselves], is investigating nine murders and one disappearance, including a shooting death that sparked a dramatic random dawn raid in south-western Sydney yesterday. Drive-by shootings: test your political IQ? What if since the Wood Royal Commission into police corruption the drugs moved from Kings Cross to Cabramatta. Then since the the NSW Parliamentary Inquiry into Cabramatta the drugs moved to Bankstown/Greenacre. Giving police more power might just be more fuel on the fire. New South Wales Shadow Police Minister Peter Debnam says he does not believe recent shootings in Sydney's south-west are the result of a family feud. And he's not on his own. Police warlords are set to take over Sydney's suburbs because police are not being supervised properly. The New South Wales Court of Criminal Appeal will today review the conviction of a man, after claims in the Police Integrity Commission (PIC) last year that police planted weapons and faked suspects' confessions. 2,500, crooked detectives? Or a corrupt Government? The Wood Royal Commission into police corruption. Where did the police learn their trade skills? Led by example perhaps? 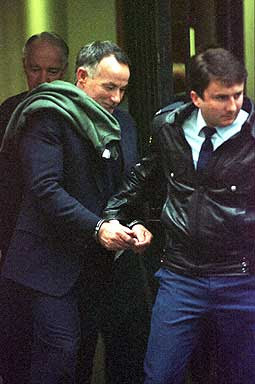 Roger Rogerson, the old hero, who never faced a result in the Lanfranchi, or Huckstepp murders, was let off in my opinion when the New South Wales Government rolled the legal system (deciding what evidence to give the police prosecutor) to have the jury believe the illusion they (the Government wanted to create).Similarly, Peter Ryan facing the Police Integrity Commission for questions about his involvement in the demise of the dysfunctional reform unit. Chess in the court (rolling the legal system).